A soursop looks like this stretched, curved , pear-shaped, green fruit with spikes from 10 cm up to 35 cm big. 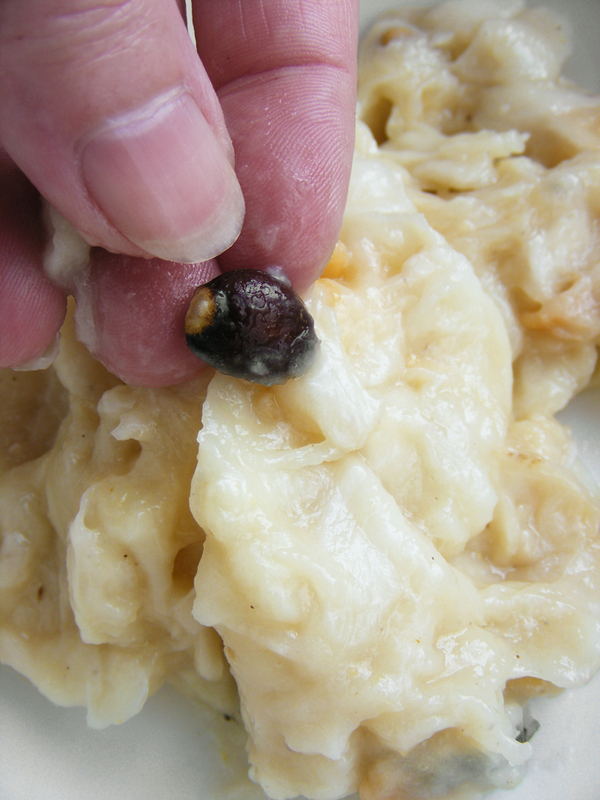 The inside has a white, pudding-like texture but is also a bit stringy and has big, brown, shiny seeds. 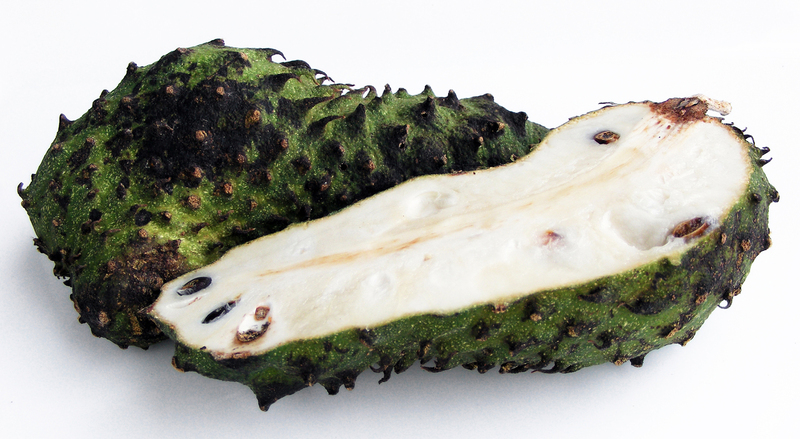 Soursop tastes sweet and sour at the same time, like a combination of strawberry, banana and lime. It’s really, really nice. Best to first peel the soursop, then cut it lengthwise and pull out the stringy core (like pears have). Over a bowl, push out the seeds one by one (see: illustrations). The result will look a bit like shiny, mushed banana. (photo). It’s much easier to buy prepared soursop, available frozen or canned. Blend the fruit for a few minutes and pass through a sieve to make sure there are no stringy bits left. Use in drinks, smoothies or icecream. It’s okay for fresh soursop to have some black spots, through the thick, leathery skin you should be able to feel the inside to be soft. Fresh soursop doesn’t keep very well, that’s why it’s not readily available in the West. The flesh turns brown when exposed to air. Make soursop juice by blending soursop with (a combination of) milk / coconutmilk / condensed milk / water / and bring to taste with palmsugar / suiker / lime / lemon / nutmeg / vanilla / cardemom / cinnamon or what you think is nice. Tea made of soursop leaves is believed to cure/prevent many illnesses.